Want to read the Bible in one year? You can accomplish your goal and experience the Bible like never before. Reading through Scripture has never been easier. That's because The Daily Bible® reorganizes the traditional arrangement of the 66 books in Scripture and places all the text in chronological order. And it's now available in the popular New Living Translation! 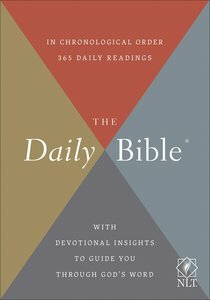 The Daily Bible® is designed to be read from cover to cover-and understood!